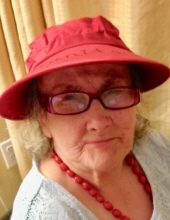 Juanita Loreen Walker, age 76, passed away peacefully at Texoma Medical Center on April 11, 2019. She was a member of the Valley Church of Christ in Gunter, and was a resident of Focused Care Nursing Home in Sherman. She was predeceased by her father, Monroe Walker, her mother, Lois Layton Walker, and a sister, Lillie Irene Walker. She is survived by her sister, Doris Walker Edwards of Sarasota, Florida; two aunts and one uncle, Mildred Achimon of Howe, Texas, Monnie and Loyd Morris of Bowie, Texas; a nephew, Terry Chapman (Gwen); a niece Darla Horn (Ron), all from Sarasota, Florida, and many cousins throughout Texas. In spite of her challenges, Juanita always spoke with love and kindness and accepted her circumstances without complaint. She loved her Lord & Savior, Jesus Christ, her Family, Gospel songs, playing Dominoes, Checkers & Bingo, old TV shows, & almost all kinds of food. To send flowers or a remembrance gift to the family of Juanita Loreen Walker, please visit our Tribute Store. "Email Address" would like to share the life celebration of Juanita Loreen Walker. Click on the "link" to go to share a favorite memory or leave a condolence message for the family.